My mom grew up in a small Northern New Jersey town which at the time had an interesting mix of Italian and Eastern European immigrants. One of the advantages of living in this mix of people was the variety of ethnic foods. We often visited relatives who stayed in the town and raised their families there. We enjoyed access to excellent fresh Italian ravioli, sausages, cold cuts, pizza, semolina bread and cannoli. We also liked to shop at the Polish owned stores which sold good rye bread, kielbasa, babka, coffee cakes and delicious pierogies (filled dumpling). Since I have not been able to visit the town in the last few years, I satisfy my cravings for those foods by learning to make some of them at home. I love pierogies and have tried various recipes over the years. This is my favorite recipe so far. To make the process more manageable I suggest making the potato filling the day before you make the dough. The dough has good flavor, and is very easy to work with. It is not sticky and does not require any flour to roll it out. I prefer not to refrigerate the dough because it is easier to work with at room temperature. My favorite way to serve them is either to pan fry in butter after boiling or just boil and top with melted butter and caramelized onions as in the photo below. Serve with sour cream on the side. Uncooked pierogies freeze well. Begin by boiling potatoes whole in their skins in lightly salted water for about 20-30 minutes until fork tender. I find the red potatoes take longer to cook than yellow. Remove potatoes as they become tender (some may take longer than others depending on the size). Let potatoes cool for about 5 minutes, then peel the skins and cut into cubes. 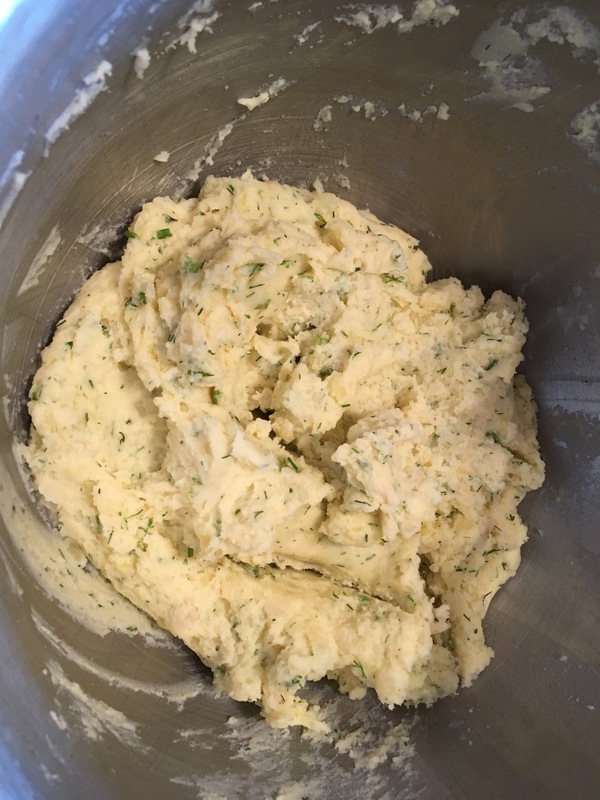 Place cubed potatoes in the bowl of a mixer. Add shredded cheese, cream cheese, sour cream, and butter. Mix, then add dill, garlic powder, and salt and pepper to taste. Mix again. The mixture should be thick and rather dry. Refrigerate until ready to use. In the bowl of a food processor combine flour and salt. Pulse to mix. Add sour cream, melted butter, and beaten eggs. Pulse until you get a crumbly mixture which will form a dough when you pinch a little of it between your fingers. Pour out onto the counter and bring dough together into a ball. Knead a bit to make it smooth. Wrap in plastic wrap and let sit for 1-1/2 hours on the counter. In a large frying pan melt butter on medium low heat. Add onions and a bit of salt. Cover and let cook for 20 minutes or until the onions are caramelized. Stir occasionally so they do not burn. Set aside while you assemble and boil pierogies. Assembly: Begin by rolling the dough. Divide the dough into 4 pieces. Roll one of the dough pieces out to 1/8-inch thick rectangle, then cut out about 15 (3-1/2 inch) circles with a cookie cutter or glass. 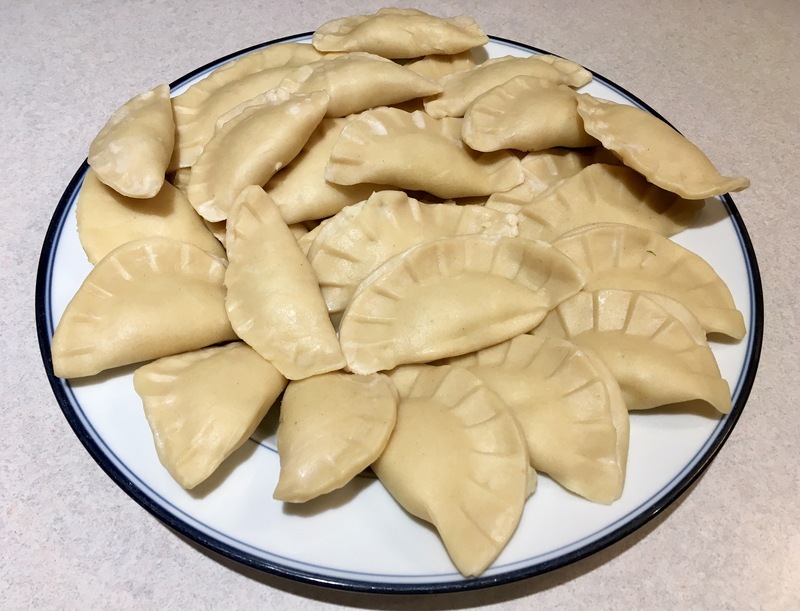 The pierogies are more tender when you do not reroll the dough scraps, but you can if you need to (it helps to let the dough relax before you re-roll). Repeat with the remaining dough pieces, rolling thin and cutting about 15 circles per piece. Fill a small bowl with warm water. I have a hand-held dumpling press I use but you can fill pierogi by hand. Take one circle of dough. Stretch it slightly without tearing it and place on the open dumpling press or in the palm of your hand. Place about 1-1/2 teaspoons of potato filling in the center of the dough. Do not overfill or the dough will tear or burst when boiled. But make sure you have enough filling so that there will be no large air pockets when dough is pressed together. Dip one finger into the warm water bowl and run it around the edge of the dough circle. Make sure you moisten the entire edge. The water will help seal the pierogi. Fold it over into a half-moon shape with the dumpling press or by hand. Squeeze the edges gently to seal the dough together. 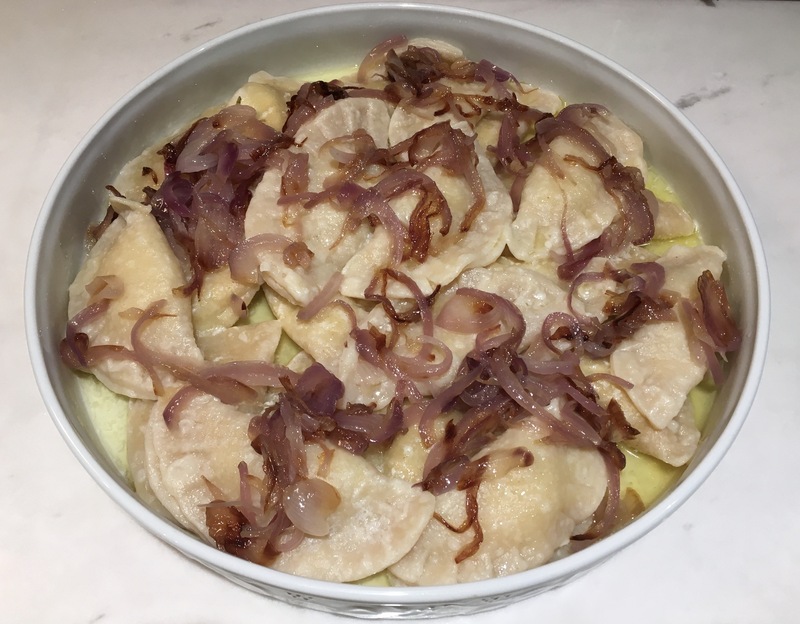 Set pierogi on a plate or baking sheet. Repeat until you have filled all your dough circles. You should have about 60 pierogies. Fill a 6-quart pot 3/4ths full with water. Cover and bring to a boil on high heat, then add 1-2 teaspoons of kosher salt. Take 12 pierogies and gently set them into the boiling water. They will quickly float to the top. Cook for about 5 minutes once they are floating. Turn them from time to time with a slotted spoon while they are boiling so both sides of the dumpling cook evenly. Remove one pierogi from the pot and taste it for doneness, then remove pierogies with a slotted spoon, draining them slightly over the pot, and place on a serving platter. Repeat by adding 12 more pierogies to the boiling water. If the water begins to evaporate, add more hot water and bring back to the boil before you add more pierogies to the pot. Do this until you have cooked all the pierogies. While the pierogies are boiling, melt a stick of salted butter. As the boiled pierogies are set on the platter lightly drizzle them with melted butter. Repeat as more cooked pierogies are added to the platter. Top with the caramelized onions. It is optional to pan fry the pierogies in butter to brown them after they are boiled. Serve with a dish of sour cream on the side. You can serve Tzatziki sauce as an alternative to sour cream (not traditional but tasty!). Makes 60 pierogies. This entry was posted in Appetizers, Pasta, Vegetarian. Bookmark the permalink. Judy – I love your bits of family history that you put into your blog. I may not be brave enough to try them all, but I certainly enjoy reading them! P.S. And imagining the taste!